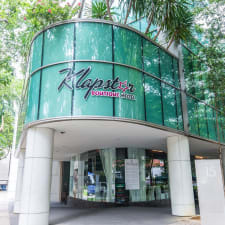 Klapstar Boutique can be found just 15 minutes away from Chinatown by foot and offers guests a range of facilities including free parking and high-speed Wi-Fi. Luxurious amenities such as a Nespresso coffee machine as well as remote-control curtains are provided in each room, while the flat screen TV and an iPod docking station offers entertainment. Luggage storage is available at the 24-hour front desk, while a concierge service is provided at Klapstar Boutique . Dry cleaning and laundry facilities are also offered on-site. The on-site bistro, The Sleeping Rhino, offers a selection of Western dishes, while breakfast is served daily. Drinks and cocktails are available in the Fabrika Sky Bar. The Maxwell Food Centre is situated only 15 minutes away from this hotel by foot, while Tanjong Pagar MRT Station is just five minutes away. This hotel can be found within Singapore's central business district. The staff at this hotel will treat you like royalty from the moment you arrive. Their friendly service and warm smiles gives this hotel an inviting atmosphere that can be felt throughout. You can rely on their abilities for just about anything, no matter the size of the task. Each room at this hotel features a beautiful outdoor balcony. This gives you a private, outdoor space to enjoy with your loved ones and friends. Some balconies include a hot tub, while the furnishings are modern and elegant. You will certainly enjoy this outdoor space during your stay. If you travel quite frequently, you will know how important it is to get a good night's rest during your stay. This hotel provides each room with quality beds and bedding to ensure that you sleep comfortably every night. As soon as your head hits the pillow, you will fall into a state of relaxation. Many guests have complained about the lack of proper cleaning at this hotel, especially in the private rooms. The housekeeping staff need to be more thorough when attending to these private spaces. This will make each guest's stay more comfortable and enjoyable. There have been several complaints concerning the lack of general maintenance at this hotel. Issues such as broken fittings, walls that need repainting as well as faulty appliances have been brought to attention by previous guests. Even though most guests found their stay enjoyable, there have been many complaints regarding the size of the rooms. Several guests have been slightly disappointed upon first entering their room, as there is not as much space as one would've hoped for.